The Tea Act of 1773 arose from the financial problems of the British East India Company and the dispute of Parliament’s authority over the colonies. The Tea Act of 1773, and the subsequent Boston Tea Party, arose from two issues confronting the British Empire in 1775. The first issue was the financial problems of the British East India Company, one of Britain’s most important commercial institutions, which by late 1772, was in a serious financial crisis as a result of declining sales and increased taxes. The second contributing issue was an ongoing dispute about the extent of Parliament ‘s authority, if any, over the British American colonies without seating any elected representation. Parliament attempted to resolve these issues through the Tea Act, which in turn set the stage for the Boston Tea Party and eventually the American Revolution. The Tea Act retained the three pence duty on tea imported to the colonies. Some members of Parliament wanted to eliminate this tax, arguing that there was no reason to provoke another colonial controversy. Boston Tea Party: A political protest by the Sons of Liberty in Massachusetts against the British government and the monopolistic East India Company that controlled an element of trade in the colonies. The Tea Act of 1773, and the subsequent Boston Tea Party, arose from two issues confronting the British Empire in 1775: first, the financial problems of the British East India Company, and second, an ongoing dispute about the extent of Parliament’s authority, if any, over the British American colonies without seating any elected representation. Parliament attempted to resolve these issues through the Tea Act, which in turn set the stage for the Boston Tea Party and eventually the American Revolution. As Europeans developed a taste for tea in the 17th century, rival companies were formed to import the product from China. In England, Parliament gave the East India Company a monopoly on the importation of tea in 1698. When tea became popular in the British colonies, Parliament sought to eliminate foreign competition by passing an act in 1721 that required colonists to import their tea only from Great Britain. The East India Company did not export tea to the colonies; by law, the company was required to sell its tea wholesale at auctions in England. British firms bought this tea and exported it to the colonies, where they resold it to merchants in Boston, New York, Philadelphia, and Charleston. Until 1767, the East India Company paid a tax of about 25% on tea that it imported into Great Britain. Parliament laid additional taxes on tea sold for consumption in Britain. In response to the colonial protests over the Townshend Acts, Parliament repealed the majority of the Townshend taxes in 1770. However, they did not repeal the duty on tea, which Prime Minister Lord North kept in order to assert Britain’s right of taxing the colonies. This partial repeal of the taxes was enough to bring an end to the non-importation movement, which colonists were using to boycott British goods, by October 1770. From 1771 to 1773, British tea was once again imported into the colonies in significant amounts, with merchants paying the Townshend duty of three pence per pound. Boston was the largest colonial importer of legal tea; smugglers still dominated the market in New York and Philadelphia. The Indemnity Act of 1767, which gave the East India Company a refund of the duty on tea that was re-exported to the colonies, expired in 1772. Parliament passed a new act in 1772 that reduced this refund, effectively leaving a 10% duty on tea imported into Britain. The act also restored the tea taxes within Britain that had been repealed in 1767, and left in place the Townshend duty in the colonies. With this new tax burden driving up the price of British tea, sales plummeted. The company continued to import tea into Great Britain, however, amassing a huge surplus of product that no one would buy. For these and other reasons, by late 1772, the East India Company, one of Britain’s most important commercial institutions, was in a serious financial crisis. Eliminating some of the taxes was one obvious solution to the crisis. The East India Company initially sought to have the Townshend duty repealed, but the North ministry was unwilling because such an action might be interpreted as a retreat from Parliament’s position that it had the right to tax the colonies. More importantly, the tax collected from the Townshend duty was used to pay the salaries of some British colonial governors and judges. Another possible solution for reducing the growing mound of tea in the East India Company warehouses was to sell it cheaply in Europe. This possibility was investigated, but it was determined that the tea would simply be smuggled back into Great Britain, where it would undersell the taxed product. The North ministry’s solution was the Tea Act, which received the assent of King George in May of 1773. This act restored the East India Company’s full refund on the duty for importing tea into Britain and also permitted the company, for the first time, to export tea to the colonies on its own account. This would allow the company to reduce costs by eliminating the middlemen who bought the tea at wholesale auctions in London. Instead of selling to middlemen, the company now appointed colonial merchants to receive the tea on consignment; the consignees would in turn sell the tea for a commission. In July of 1773, tea consignees were selected in New York, Philadelphia, Boston, and Charleston. The Tea Act retained the three pence Townshend duty on tea imported to the colonies. Some members of Parliament wanted to eliminate this tax, arguing that there was no reason to provoke another colonial controversy. However, North did not want to give up the revenue from the Townshend tax, primarily because it was used to pay the salaries of colonial officials; maintaining the right of taxing the Americans was a secondary concern. Lord North: Lord North, seen here in Portrait of Frederick North, Lord North (1773–1774), painted by Nathaniel Dance, was prime minister at the time of the passage of the Tea Act. In response to the British Tea Act of 1773, the Sons of Liberty took action in what would later be known as the Boston Tea Party. The Boston Tea Party, a famous symbolic action against the Tea Act of 1773, was a culmination of a resistance movement throughout the colonies. Colonists objected to the Tea Act for a variety of reasons, especially because they believed that it violated their right to be taxed only by their own elected representatives. Protesters had successfully prevented the unloading of taxed tea in three other colonies; however in Boston, Royal Governor Thomas Hutchinson refused to allow the tea to be returned to Britain. On the evening of December 16th, a small group of colonists, some dressed in Mohawk warrior disguises, boarded the three vessels and, over the course of three hours, dumped all 342 chests of tea into the water. This act soon inspired further acts of resistance up and down the East Coast; however, not all colonists supported the dumping of the tea. The wholesale destruction of property shocked people on both sides of the Atlantic. Samuel Adams: An American statesman, political philosopher, and one of the founding fathers of the United States. British East India Company: A 17th-century joint stock company founded to trade with India to Britain’s advantage. Sons of Liberty: An organization of American colonists that was created in the 13 American colonies; the secret society formed to protect the rights of the colonists and to fight taxation by the British government. Upon hearing word of the details in the British Tea Act of 1773, the Sons of Liberty took action after officials in Boston refused to return three shiploads of taxed tea to Britain. The Boston Tea Party was the culmination of a resistance movement throughout British America against the Tea Act, which had been passed by the British Parliament in 1773. Colonists objected to the Tea Act for a variety of reasons, especially because they believed that it violated their right to be taxed only by their own elected representatives. Protesters had successfully prevented the unloading of taxed tea in three other colonies, but in Boston, embattled Royal Governor Thomas Hutchinson refused to allow the tea to be returned to Britain. In September and October of 1773, seven ships carrying British East India Company tea were sent to the colonies. Four were bound for Boston, New York, Philadelphia, and Charleston. In the ships were more than 2,000 chests containing nearly 600,000 pounds of tea. Americans learned the details of the Tea Act while the ships were en route, and opposition began to mount. Activists calling themselves the Sons of Liberty began a campaign to raise awareness and to convince or compel the consignees to resign, in the same way that stamp distributors had been forced to resign in the 1765 Stamp Act crisis. “Americans throwing Cargoes of the Tea Ships into the River, at Boston”: 1789 engraving of the destruction of the tea in Boston Harbor. 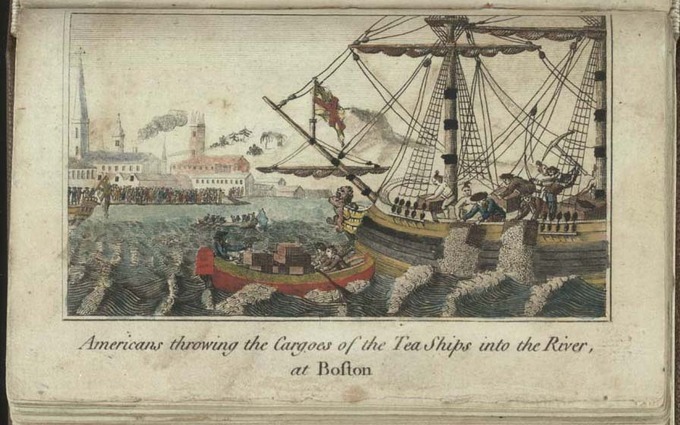 South of Boston, protesters successfully compelled the tea consignees to resign. In Charleston, the consignees had been forced to resign by early December, and the unclaimed tea was seized by customs officials. By early December, the Philadelphia consignees had resigned and the tea ship returned to England with its cargo following a confrontation with the ship’s captain. The tea ship bound for New York City was delayed by bad weather. By the time it had arrived, the consignees had resigned, and the ship returned to England with the tea. In every colony except for Massachusetts, protesters were able to force the tea consignees to resign or to return the tea to England. In Boston, however, Governor Hutchinson was determined to hold his ground. He convinced the tea consignees, two of whom were his sons, not to back down. When the tea ship, Dartmouth, arrived in Boston Harbor in late November, Sons of Liberty leader Samuel Adams called for a mass meeting. British law required the Dartmouth to unload and pay the duties within 20 days, or customs officials could confiscate the cargo. The mass meeting passed a resolution, introduced by Adams and based on a similar set of resolutions promulgated earlier in Philadelphia, urging the captain of the Dartmouth to send the ship back without paying the import duty. Meanwhile, the meeting assigned men to watch the ship and prevent the tea from being unloaded. Governor Hutchinson refused to grant permission for the Dartmouth to leave without paying the duty. Meanwhile, two more tea ships, the Eleanor and the Beaver, arrived in Boston Harbor. While Adams tried to reassert control of the meeting, people poured out of the Old South Meeting House to prepare to take action. On the evening of December 16th, a small group of colonists, some dressed in Mohawk warrior disguises, boarded the three vessels and, over the course of three hours, dumped all 342 chests of tea into the water. Protected by a crowd of spectators, they systematically destroyed goods worth almost $1 million in today’s dollars—a very significant loss. Whether or not Samuel Adams helped plan the Boston Tea Party is disputed, but he immediately worked to publicize and defend it. He argued that the Tea Party was not the act of a lawless mob, but was instead a principled protest and the only remaining option the people had to defend their constitutional rights. By “constitution,” he was referring to the idea that all governments have a constitution, written or not, and that the constitution of Great Britain could be interpreted as banning the levying of taxes without representation. This act soon inspired further acts of resistance up and down the East Coast. However, not all colonists, and not even all patriots, supported the dumping of the tea. The wholesale destruction of property shocked people on both sides of the Atlantic. In Britain, this act united all parties against the colonies. The British government felt this action could not remain unpunished; they responded by closing the port of Boston and putting in place other laws known as the “Coercive Acts.” The tax on tea was repealed with the Taxation of Colonies Act of 1778, part of another Parliamentary attempt at conciliation that eventually failed. The Coercive Acts were meant to reverse the trend of colonial resistance but actually provoked higher levels of resistance. The Coercive Acts describe a series of laws passed by the British Parliament in 1774, relating to Britain’s colonies in North America. Passed in response to the Boston Tea Party, the Coercive Acts sought to punish Massachusetts as a warning to other colonies. The Coercive Acts consisted of the Boston Port Act, the Massachusetts Government Act, the Administration of Justice Act, and the Quartering Act of 1774. Tensions escalated over the Coercive Acts and the American Revolutionary War broke out the following year. charter: A document issued by some authority, creating a public or private institution, and defining its purposes and privileges. The Coercive Acts are names used to describe a series of laws relating to Britain’s colonies in North America and passed by the British Parliament in 1774. Four of the acts were issued in direct response to the Boston Tea Party of December 1773. By making an example of Massachusetts, the British Parliament hoped these punitive measures would reverse the trend of colonial resistance to parliamentary authority that had begun with the 1765 Stamp Act. Many colonists, however, viewed the acts as an arbitrary violation of their rights. In 1774, they organized the First Continental Congress to coordinate a protest. As tensions escalated, the American Revolutionary War broke out the following year. The first of the acts passed in response to the Boston Tea Party was the Boston Port Act. This law closed the port of Boston until the East India Company had been repaid for the destroyed tea and the king was satisfied that order had been restored. Colonists objected that the Port Act punished all of Boston rather than just the individuals who had destroyed the tea. They also contended that they were being punished without having been given an opportunity to testify in their own defense. The Massachusetts Government Act provoked even more outrage than the Port Act because it unilaterally altered the government of Massachusetts to bring it under control of the British government. Under the terms of the Government Act, almost all positions in the colonial government were to be appointed by the governor or the king. The act also severely limited the activities of town meetings in Massachusetts to one meeting a year, unless the governor called for one. Colonists outside of Massachusetts feared that their governments could now also be changed by the legislative fiat of Parliament. The Administration of Justice Act allowed the governor to move trials of accused royal officials to another colony, or even to Great Britain, if he believed the official could not get a fair trial in Massachusetts. Although the act stipulated that witnesses would be paid for their travel expenses, in practice, few colonists could afford to leave their work and cross the ocean to testify in a trial. George Washington called this the “Murder Act,” as he believed that it allowed British officials to harass Americans and then escape justice. The Quartering Act applied to all of the colonies and sought to create a more effective method of housing British troops in America. In a previous act, the colonies had been required to provide housing for soldiers, but colonial legislatures had been uncooperative in doing so. The new Quartering Act allowed a governor to house soldiers in other buildings if suitable quarters were not provided. Although many colonists found the Quartering Act objectionable, it generated the least amount of protest of the Coercive Acts. Many colonists saw the Coercive Acts as a violation of their constitutional rights, their natural rights, and their colonial charters. They viewed the acts as a threat to the liberties of all of British America, not just Massachusetts. The citizens of Boston viewed the Coercive Acts as unnecessary and cruel punishment that inflamed outrage against Britain even further. Great Britain hoped that the Coercive Acts would isolate radicals in Massachusetts and cause American colonists to concede the authority of Parliament over their elected assemblies. However, the acts unintentionally promoted sympathy for Massachusetts and encouraged colonists from the otherwise diverse colonies to form the First Continental Congress. “The Able Doctor, or America Swallowing the Bitter Draught” (London Magazine, May 1, 1774): The artist of this image targets select members of Parliament as the perpetrators of a devilish scheme to overturn the constitution; this is why Mother Britannia weeps. Note that this cartoon came from a British publication; Great Britain was not united in support of Parliament’s policies toward the American colonies. The First Continental Congress was a convention of 12 colonial delegates that met on September 5, 1774, in Philadelphia, Pennsylvania. The First Continental Congress was called in response to the passing of the Coercive Acts by the British Parliament. The Congress was attended by 56 members appointed by the legislatures of 12 of the 13 colonies, the exception being the Province of Georgia. The Congress met briefly to consider options, including an economic boycott of British trade, rights and grievances, and petitioning King George III for redress of those grievances. The Congress also called for a second Continental Congress in the event that their petition was unsuccessful in halting enforcement of the Coercive Acts. The delegates also urged each colony to set up and train its own militia. Pennsylvania and New York sought a resolution with Great Britain; other colonies were split between those who sought legislative equality with Britain and those who favored complete independence. Out of the First Continental Congress came the articles of the Continental Association and the Petition to the King. When the petition citing grievances was disregarded by King George III, a Second Continental Congress was planned. Boston Tea Party: A political protest by the Sons of Liberty in Massachusetts against the British government and the monopolistic East India Company. Second Continental Congress: A convention of delegates from the 13 colonies that started meeting on May 10, 1775, in Philadelphia, Pennsylvania, soon after warfare in the American Revolutionary War had begun. Coercive Acts: A series of laws (also called the Intolerable Acts) passed by the British Parliament in 1774, relating to Britain’s colonies in North America. The acts triggered outrage and resistance in the 13 colonies and were important developments in the growth of the American Revolution. The First Continental Congress was a convention of delegates from 12 British North American colonies that met on September 5, 1774, in Philadelphia, Pennsylvania. It was called in response to the passage of the Coercive Acts by the British Parliament. The Congress was attended by 56 members appointed by the legislatures of 12 of the 13 colonies. The sole exception was the Province of Georgia, which was hoping for British assistance with American Indian conflicts on its frontier. The Congress met briefly to consider options, including an economic boycott of British trade, rights and grievances, and petitioning King George III for redress of those grievances. The Congress also called for another Continental Congress in the event that their petition was unsuccessful in halting the enforcement of the Coercive Acts. Their appeal to the Crown had no effect, and so the Second Continental Congress was convened the following year to organize the defense of the colonies at the onset of the American Revolutionary War. The delegates also urged each colony to set up and train its own militia. 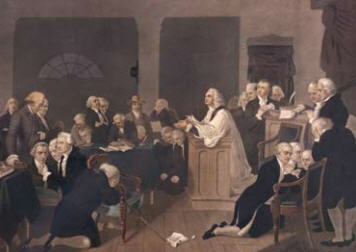 The Congress: An opening prayer at the First Continental Congress, September 7, 1774, in Philadelphia, Pennsylvania. The need for a Continental Congress grew out of the British blockade at the Port of Boston in response to the Boston Tea Party in 1773. The colonies were united in their effort to demonstrate their authority to Great Britain by virtue of their common causes and through their unity. The delegates organized an economic boycott of Great Britain in protest against the Coercive Acts passed by the British Parliament in 1774, and petitioned the King for a redress of grievances. Nevertheless, their ultimate objectives were not consistent. Pennsylvania and New York had sent delegates with firm instructions to pursue a resolution with Great Britain. While the other colonies all held the idea of colonial rights as paramount, they were split between those who sought legislative equality with Britain and those who instead favored independence and a break from the Crown and its excesses. On October 26, 1774, the First Continental Congress adjourned. They agreed to reconvene in May of 1775, if Parliament still did not address their grievances. Only one colony failed to establish local enforcement committees; in the others, the restrictions were dutifully enforced (by violent measures, on some occasion). Trade with Great Britain fell sharply, and Parliament responded by passing the New England Restraining Act, which prohibited the northeastern colonies from trading with anyone but Britain and the British West Indies and barred colonial ships from the North Atlantic fisheries. These punitive measures were later extended to most of the other colonies as well. The Petition to the King was also formed during the First Continental Congress and sent to George III of Great Britain. The petition expressed loyalty to the king and hoped for redress of grievances relating to the Coercive Acts and other issues that helped foment the American Revolution. In London, Parliament debated the merits of meeting the demands made by the colonies. However, it took no official notice of Congress’ petitions and addresses. On November 30, 1774, King George III opened Parliament with a speech condemning Massachusetts. At that point, it became clear that the Continental Congress would have to convene once again. 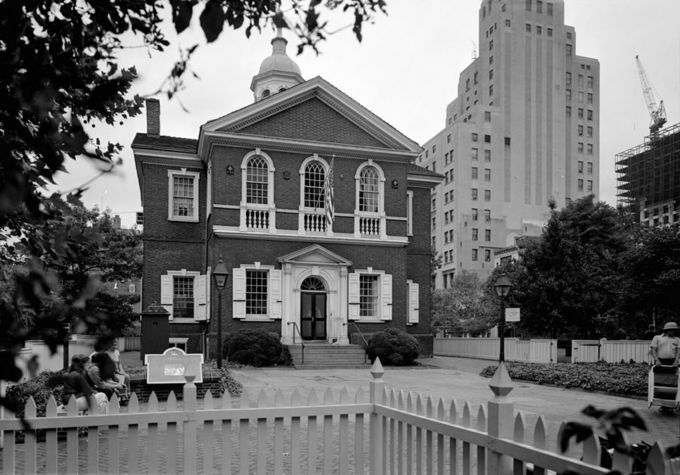 Carpenter’s Hall: The First Continental Congress met briefly in Carpenter’s Hall in Philadelphia, Pennsylvania, from September 5–October 26, 1774.